Abnormal expression of CCR4 and its ligands in human renal cancer. (A) CCR4 mRNA was measured by real-time RT-PCR in RCC biopsies and compared with normal kidney. 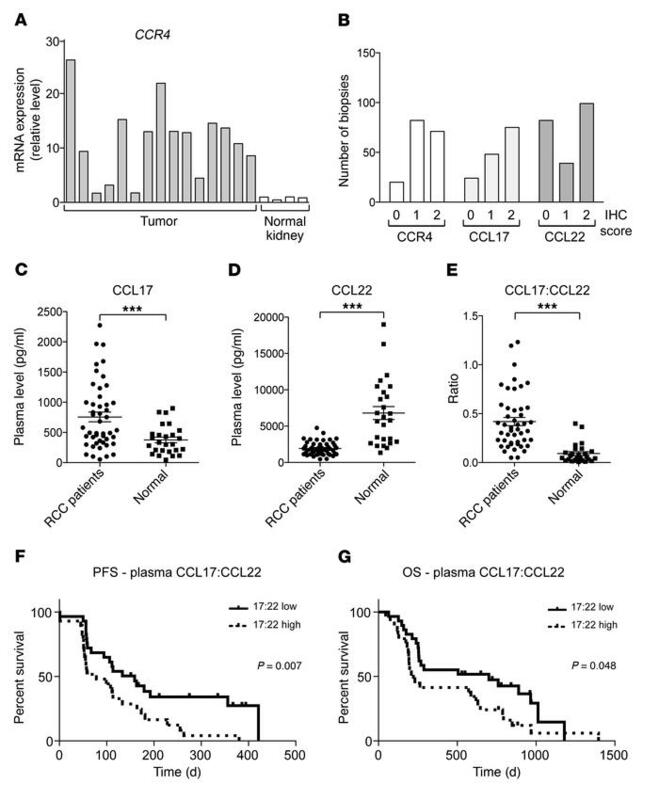 (B) Levels of CCR4 and its ligands CCL17 and CCL22 were analyzed by IHC in a TMA of renal cancer biopsies from human patients. Each biopsy was scored 0, no staining; 1, weak staining; 2, strong staining for CCR4, CCL17, and CCL22. A total of 173 biopsy cores from 57 patients were stained for CCR4 and CCL22, and 145 cores from 48 patients for CCL17. (C–E) Plasma levels of CCL17 and CCL22 and the CCL17/CCL22 ratio in RCC patient plasma were compared with those from normal individuals of matched age using Meso Scale Discovery System Ultra-Sensitive plates. n = 47 for RCC patients, n = 26 for normal individuals; 2-tailed Student’s t test, ***P = 0.0001 for CCL17 (C), CCL22 (D), and CCL17/CCL22 (E). (F and G) Kaplan-Meier survival curves for progression-free survival (PFS; F) and overall survival (OS; G) for RCC patients with CCL17/CCL22 high (above the median) or low (n = 57). For progression-free survival, hazard ratio 0.436, 95% CI 0.239–0.797; for overall survival, hazard ratio 0.552, 95% CI 0.306–0.995.